If you read my column, you may think that I breathe, sleep and live for my next recipe, which is not entirely accurate. I also consider the most entertaining and efficient way of burning calories from the food I consume, and a bonus is discovering a recipe that’s yummy, healthy, and will provide sustained energy throughout the day. So it only follows I’d enjoy YogaFLEX classes; after 45 minutes of stretching and toning, the instructor, Marty Betts, provides a healthy, home-baked treat after class. Marty's Yoga Class: "That was Zen; this is Tao." 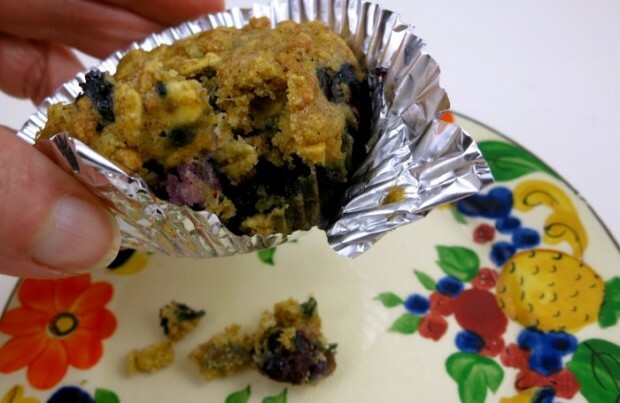 From personal experience, these blueberry-studded muffins are also delicious, and I felt as nurtured as a pre-schooler sitting on my mat, munching on a snack after recess. 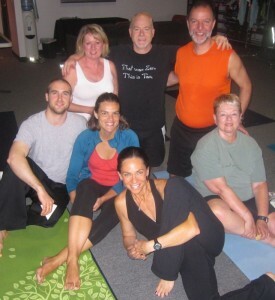 “This is not your traditional yoga class, and no previous experience is required,” says Marty. “YogaFLEX is a yoga-inspired, stretching and core strengthening class to help improve strength, flexibility and range of motion.” Marty tells me her routines are also meant to help avoid injury, as chronic injuies can eventually self-correct through gentle yet consistent stretching. The low-lit studio and hum of world music provides a tranquil yet stimulating atmosphere; the slight soreness in my muscles the next day was a gentle reminder I should take this class more often. .
Marty tells me the muffin yield in the following recipe is large but could be halved. Extras may be kept 2-3 days refrigerated and they may be frozen up to 6 weeks. She welcomes new visitors by offering the first class for free. Next week Marty’s making her protein-rich yoga bars, to further tempt you to join her. The classes are $12 each (packages available) and are taught every Saturday from 9:30-10:15 at the Running Institute (in the Running Fit building) on 5700 Jackson Road, just off the Zeeb exit on I-94. For more information, you can email Marty at martyart1@comcast.net. In a large bowl, combine the flour, oats, cereal, wheat and oat brans, sugar, baking soda, baking powder and salt; set aside. In a smaller bowl whisk together vanilla, oil, eggs and almond milk until combined. Pour the wet ingredients into the dry ingredients, and stir until mixture is just moistened. Fold in the blueberries, nuts or seeds, and cereal. Fill paper-lined muffin cups two-thirds full. Bake on center rack of oven 14-17 minutes or until a toothpick comes out clean. Cool for 5 minutes before removing from pans to wire racks. Most delicious served warm. More Recipes Filed Under "All Desserts"